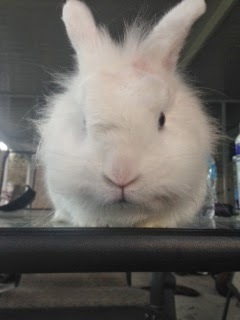 Gosh its Wednesday again so time for another Disapproving Bun and todays star is Dexter who is on Instagram @dexter_the_bunny ,Thanks Teresa.
" Hoomin I demand More Strawberries! " Quick get some strawberries asap! Oh oh...my comment did not go through! Yikes! We hope Dexter's Hoomin didn't waste any time getting him more strawberries! Found him on IG and am now following! What a cutie. I'll be moving soon, and I'm contemplating the idea of getting a rabbit. Dexter demand and you shall get methinks. That is a very serious look! And, like you, I eat strawberries ! Did you get the strawberry Dexter? Or did you have to find it yourself? He is cute. So fluffy. I would have to give into him and give him more strawberries. I hope Dexter got his strawberries. Mmmmm! I absolutely LOVE strawberries!! I never thought a bunny and myself would have something in common, but it is pawsome! Human, are you listening? Strawberries on the double! I wouldn't mess with Dexter with a disapproving face like that! Ohhhh...that bun is. Ot happy, no, not happy at all..."get those berries to the white bun counter two!" Did askin' for more result in gettin' more? I really need to know. If it worked, I'm gonna ask for more nip. This is a brave new world for me: buns, bunnies and strawberries, oh my! This fine Disapprover knows that hoomins have to be treated sternly. Also, that hoomins are not very buntelligent, and need things explained several times! I'm sorry we hoomins are so stoopid, Dexter! Hi there Dexter, you are just too cute. We don't blame you one bit for wanting more strawberries. They are good to eat. Have a most wonderful day. Apawz Apawz fer Dexter!! He iz a dizapprovin bunneh fer shure n so hansum!!! me wuud bring him all da strawburriez he wantz wif DAT face! !